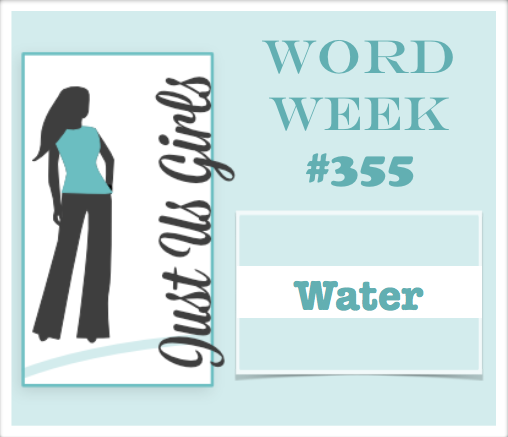 Hello, It’s Word Week over at Just Us Girls and the word Sharyn has for us is Water. I made the above card for a very dear friend and fellow design team member Judy, as it was just her birthday a little over a week ago. The other girls and I couldn’t believe she was 70. Age is just a number right? I hope she loved my card as much as I loved making it for her. I have to give credit where credit is due. Here is the terrific card I cased. You can’t tell in my photo but the bubbles, the seahorse, and the fish all are covered in glossy accents. I so wanted to write Birthday Fishes on my sentiments but after 5 attempts with tiny alphabet stamps, it just wasn’t meant to be. The stamps are a collage of this and that, so if you have any questions just let me know! The seahorse is a die- cut that I sponged, the background is sponges as well and the waves are a MFT die. Oh, and the fish were colored with colored pencils. Before I go, I would like to welcome Colleen Foelker our Guest Designer to the team! I have been fortunate enough to meet Colleen in person and she is as sweet as she is talented! Welcome Colleen, we are thrilled to have you joining us this month! Love your underwater scene Nancy! The colors are fabulous and fun! This is the cutest water card. Love those fishes done with the glossy accents. Love detail like the extra leaves and flowers along the bottom too. I hope that sea horse is one that I sent you. If not, don’t let me, I love to fantasize. Our day is coming soon. This is sweet! I LOVE the colors you selected and your design is amazing!! most of all, though, I love the faces on those fish! LOL so determined : ) I know your friend was blessed! Cute underwater scene. Nice coloring too! Beautiful design and great colors! Love the cute seahorse and fishies! Cutest Fish and Seahorse I have seen!! Love their wonderful colors and their happy faces!! Thank you for welcoming me for the whole month!! so honored to be with you girls!! Have a great Saturday! Funtabulous card Nancy. So colourful especially the sea horse and those cute fishes. I know Judy would love this card especially as it has ‘purple’. Awesome creativity here. I just have to smile when I see your card, Nancy. The bright colored fish swimming along with the seahorse over those die cut waves make quite the scene. 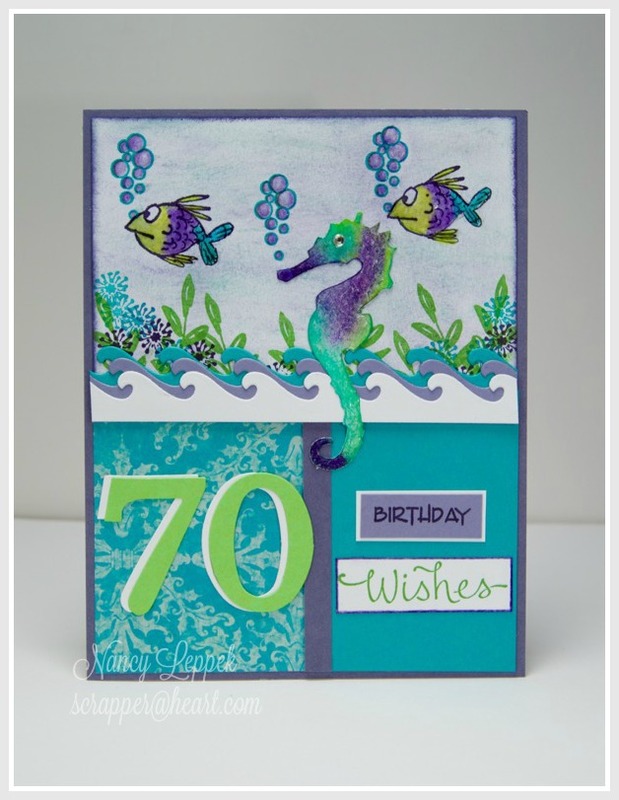 Great card and I love the colors and that seahorse! What a cute card. Love the seahorse and fishes, and perfect colors. A great scene you created. I love, love, love my card, and was so surprised and pleased to see you used it in this challenge. The glossy accents add so much to the whole effect, perfection!!! And I love that you put my age on there, very nice. It’s gorgeous, thanks so much for thinking of me, and great take on the challenge. Nancy what a fabulous milestone birthday card. I love the colour combo and all the elements you’ve used to create your water scene. Thanks for sharing. This is fantastic and what a wonderful card for our dear Judy! I really like the expressions on the fish, too cute!